Enjoy your cabin with a little help from Mobility at Sea! Sometimes all you need is a little help to make your chosen cabin a little more comfortable. As there are only a certain number of accessible cabins on each cruise, it could mean that you need to book the cruise way in advance. Recent ABTA statistics show that more people from the UK and Ireland are choosing an ocean cruise than ever before. The demand is far greater than the number of accessible cabins. 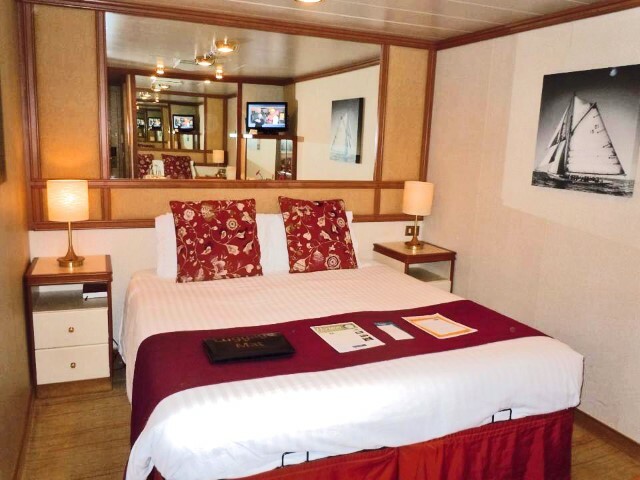 At Mobility at Sea, we are experts in cabin layouts and sizes for many of the top cruise providers including Cunard, P&O, Celebrity Cruises, Royal Caribbean, MSC, Fred. Olsen, Princess Cruises, and Saga. 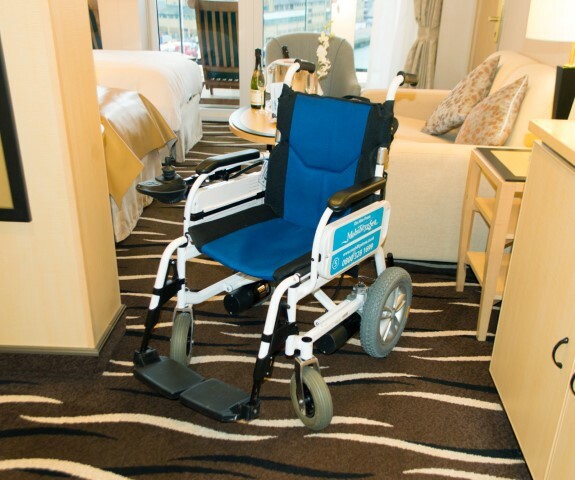 Our team will assess your needs so that we can provide the mobility equipment which is most suitable for your cabin. Here are just a few products to make your cabin more comfortable. We introduced the Cruiser 12A to overcome the restrictions placed on motorised transport by P&O and Cunard on their cruise ships. It has since become an extremely popular powerchair for new and returning customers. A great thing about this powerchair is that it fits nicely in a standard cabin which is perfect for customers who don't particularly want to book an accessible cabin. Once you're inside the cabin, the chair will fold like a manual wheelchair ready to be stored away. It can be adjusted so that you can find a comfortable sitting position. The 2x8Ah batteries can give a top speed of 4 mph (6.4 kmh) which is estimated to be a running time of 5 hours. Designed for practicality, the perching/shower stool is suitable for non-accessible cabin shower enclosures on most ships. It is height adjustable and has cranked feet which allow the ferrules full contact with the floor, providing the user with comfort and security. Please note it is the customers' responsibility to check the footprint of this item against the footprint of the shower enclosure. The risk of back pain and other musculoskeletal disorders (MSDs) is a very real issue for carers. Consider the amount of physical effort that is required and the awkward positions that a nurse or carer may have to get into when transferring a patient from a sitting to a standing position. The use of a Rotunda patient transfer aid can remove the need for manual handling and lower the risk of injury to the carer, whilst providing a safer, more dignified and comfortable transfer solution for the patient. A Bath Bench clips to each side of the bath and is secured in place by two brackets with rubber buffers to stop it slipping. The reinforced plastic slats are made to provide a strong seat with a maximum user weight of up to 30 stone. The brackets include a serrated face and rubber buffers to help secure the board in place. Can also be angled to position the board further back into the bath. Rubber pads under the slats help prevent the bath board from slipping on the rim of the bath. If you would like to hire some mobility equipment for your next cruise, please feel free to browse our website. Alternatively, call one of our friendly team on 0800 328 1699 where we'd be more than happy to help.